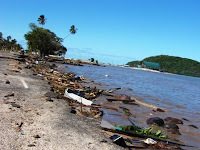 AFP - LALOMANU, Samoa - Aid is on its way to the Samoan islands after a tsunami flattened villages and killed more than 100. Another Australian child has been killed by the tsunami in Samoa. A 15-month-old boy is the latest victim, taking the Australian death toll to four. Maree Ann Blacker, 50, from Tasmania, a six-year-old girl and Ballarat teacher Vivien Hodgins - and a New Zealand toddler, aged two, who has Australian permanent residency, are also among the dead. But officials say they have now made touch with six Australians whom they previously hadn't been able to account for. "Six Australians who were unaccounted for in the affected area have had their safety and welfare confirmed this morning," a spokeswoman said. Authorities still have grave concerns for one other Australian. Another six nationals are in hospital, while an unidentified number of Australians received minor injuries in the disaster. At least 144 people have died in the tsunamis that hit the Pacific island nations of Samoa, American Samoa and Tonga when towering waves pounded the remote Pacific islands after the 8.0-magnitude undersea quake struck, officials say. "There are 110 people dead in Samoa so far, but we are still counting," the government official told AFP on condition of anonymity. "There is a search and rescue operation underway right now and we are trying to recover those who are unfortunately still under the rubble or in the sea," he said. "We will make a formal statement on the latest toll later today." A further 27 people are confirmed dead in neighbouring American Samoa, while seven people were killed in Tonga, around 1,000 kilometres from Samoa, by tsunamis triggered by Tuesday's massive 8.0-magnitude earthquake.